ONE: It’s an epic musical on a revolve, so think Les Miserables set in London any time since, but influenced by Sondheim because although this is the most ‘musical theatre’ version we’ve ever seen the Kurt Weill tunes are often atonal and discordant, but delivered here as superbly as you could ever hope by some ridiculously fine singers like George Ikediashi and Rosalie Craig. TWO: Don’t try to follow the plot. Macheath is a knife-wielding gangster, his camp father-in-law Peachum is king of the beggars: everyone else is a crook, a crack whore, or a Keystone Kop, sometimes all three. Let it flood over you but keep an eye on your wallet. Simon Stephens who adapted The Curious Incident of the Dog in the Night Time has been allowed to play fast and loose with the script so it’s earthy, filthy and constantly in-your-face. Good. THREE: Just because the back wall of the Olivier is exposed and most of the set looks made of paper and plywood, the National isn’t going bankrupt. Not this week. It’s probably clever and ironic and an hommage to Edward Gordon Craig who thoughts sets were symbolic and actors merely puppets: Macheath’s crimes are enacted in a life-sized Punch and Judy show so that fits. FOUR: Disregard anyone who tells you Rory Kinnear isn’t a natural singer, or right for this part because he’s not a swaggering lounge lizard like Tim Curry in 1986. 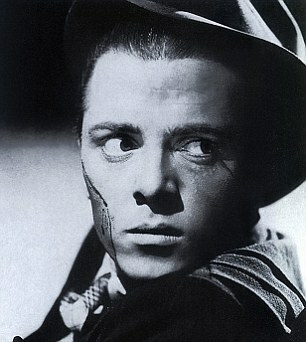 At first he might remind you of Richard Attenborough as the boyish razor-gang boss Pinkie in Brighton Rock, all icy determination and a shiny suit, but then such is the genius and meticulous nature of the National’s research he turns out to be a dead ringer for Harald Paulsen in the 1928 original. FIVE: Contradict interval ponces who quote The Guardian saying the design is ‘reminiscent of an Otto Dix painting’. We did art at school too and actually with its expressionistic satirising of capitalism, prostitution, militarism and the middle classes from a Dadaist perspective, it’s 100% George Grosz. Threepenny Opera continues at the Olivier Theatre until 1 October in the current booking period.